Hello all! Hope you're doing well. This past Sunday was Father's Day here in the U.S. Both Mother's Day and Father's Day often make think about my own parents and how to be a good parent of my own someday. What kind of legacy do parents leave? How do their grown-up children view their parents? Hello all! Hope you’re doing well. This past Sunday was Father’s Day here in the U.S. Both Mother’s Day and Father’s Day often make think about my own parents and how to be a good parent of my own someday. What kind of legacy do parents leave? How do their grown-up children view their parents? How can you be a good partner in raising your children? I don’t have any answers just yet, but the universe seems to been of similar mind – this past week’s writing and book news that jumped out to me is tied to familial relationships. For instance, an online auction closed Monday on original copies of books written by Barack Obama’s father. To me it seems incredible that every facet of a president’s family and his upbringing isn’t scrutinized and combed through, never mind only recently found. Aside from the educational component (they were Luo language learners), the books have their own historical impact too – Obama Sr. flew to Hawaii on the proceeds from those books. Without them, he might never have met Barack Obama’s mother and the U.S. might not have gotten its first black president in 2009. Speaking of mothers, Native American author Sherman Alexie, who is known for his novels Smoke Signals and The Absolutely True Diary of a Part-Time Indian, recently released a memoir titled You Don’t Have to Say You Love Me which focuses his mother who passed away from cancer in 2015. I watched the movie adaptation of Smoke Signals in high school and can definitely recommend it: even if you aren’t American and beholden to learning about Native life in the U.S., you can still connect with Alexie’s characters and their struggles. 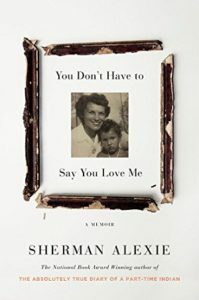 In Smoke Signals especially Alexie plays with depicting the painful truth of his characters’ lives while also fudging the narrative at times to write happier stories for them. Truth and a voice is something that is oft-denied to people of color. 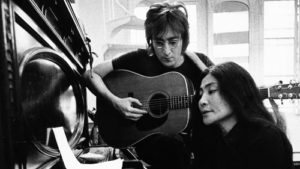 I was particularly reminded of this when it was recently announced that Yoko Ono will finally receive credit for co-writing “Imagine,” a song that was previously attributed solely to the late John Lennon. Despite the “love for all” theme of the song and even Lennon’s own admittance before his death that Ono deserved co-credit for the song, it wasn’t until last Wednesday, almost 50 years after “Imagine” first came out, that Ono is getting her due. John Lennon and Yoko Ono, 1971. Photographer unknown. If song lyrics are going to be considered to be a literature genre now (as the Nobel Committee for Literature seems to have decided when they awarded Bob Dylan a Nobel last year for his work as a lyricist), it’s more than past time that people of color like Yoko Ono are recognized for their work in song writing. The same goes for any person of color in any industry or field – we shouldn’t have to wait years for them to be recognized. Their children, and other children of color, deserve to see their parents lauded for their achievements.